[325 Pages Report]The global automotive lead acid batteries market was valued at USD 34.30 billion in 2015 and is projected to reach USD 45.03 billion by 2021, at a CAGR of 4.8% from 2016 to 2021. The market is expected to witness growth in the coming years, owing to the increasing demand for SLI (start lighting and ignition) batteries from the OEM and replacement market of the automotive industry. Automotive lead-acid battery market is directly related to the performance of automotive industry, i.e. if the automobile industry is witnessing growth then automotive lead-acid battery market would also reflect growth and vice-versa. In recent years it has been observed that there is rapid growth in the automotive industry in the Asia-Pacific region. Asia-Pacific region has reported surge in the overall passenger car sales. Leading automotive lead-acid battery manufacturing companies includes Johnson Controls, Exide Technologies, EnerSys, and GS Yuasa among others. The major factors driving the market in Asia-Pacific region are, high replacement demand from consumers with significantly high disposable incomes, and the large affluent expatriate population. Growing demand for lithium-ion batteries and risk of battery explosion due to overcharging of batteries are the major restraints for the market. The market for lithium-ion batteries is expected to witness substantial growth in the coming future, owing to the growing demand for the storage of electricity. These batteries are light weight and compact, which makes them the strongest contenders in the battery energy storage market. Also, lithium-ion batteries use non-aqueous electrolytes that offer high operating voltages compared to lead-acid batteries and sodium-sulfur batteries, which use aqueous electrolytes. Several incidents of explosions of lead-acid batteries have been reported around the globe. These explosions have been reported in mines & quarries, stationary & mobile plants, and in vehicles as well. Flooded batteries are also called as vented batteries, which requires periodic monitoring and topping up with distilled water for longevity. Flooded batteries support the automotive applications by meeting the needs of OEM’s and aftermarket customers. These batteries are cheaper than VRLA batteries in terms of value. Flooded batteries are ideal for traction, UPS, and marine applications. Enhanced flooded batteries are sealed casing batteries and are also known as maintenance free batteries. These are higher version of flooded batteries in terms of battery technology. Enhanced flooded batteries are designed to meet the demand from the automobile industry by offering a cost-effective solution for entry level and conventional start-stop vehicles. These batteries are usually used in micro-hybrid vehicles and are ideal for start-stop application. Valve Regulated Lead-Acid (VRLA) batteries are also called as maintenance free batteries. They have higher charge acceptance which helps the batteries to charge quickly. They can be classified into VRLA AGM and VRLA Gel batteries. VRLA AGM is a class of VRLA battery in which the electrolyte is absorbed into a mat of fine glass fibre. VRLA AGM battery have longer life and higher tolerance for extreme environmental conditions. VRLA Gel battery contains a mixture of silica gel with electrolyte. VRLA Gel batteries are used for emergency lighting, UPS, and wheelchairs. 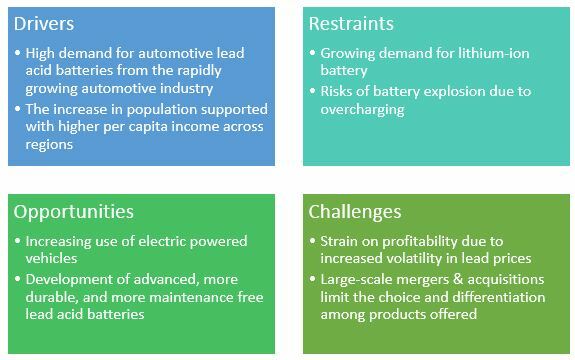 To analyze competitive developments, such as acquisitions, investments, expansions, partnerships, agreements, joint ventures, and new product developments in the automotive lead acid batteries market. 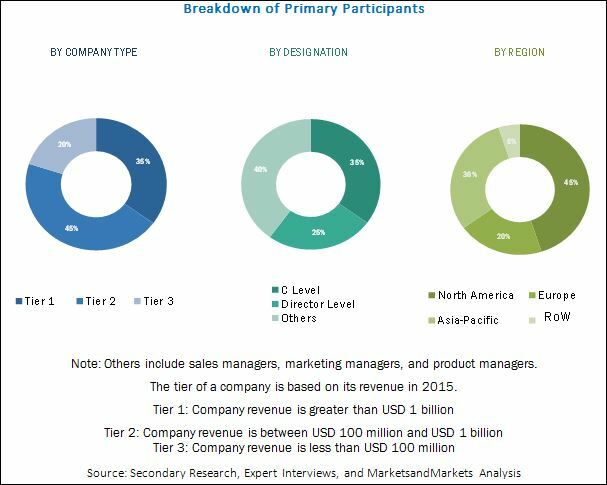 The research methodology used to estimate and forecast the automotive lead acid battery market begins with capturing data on key vendor revenues through secondary research. Secondary research was mainly conducted to obtain key information about the industry’s supply chain, the market’s monetary chain, the total pool of players, and market classification & segmentation according to industry trends to the bottom-most level, regional markets, and key developments from both market and technology-oriented perspectives. The primary sources are mainly experts from core and related industries and preferred suppliers, manufacturers, distributors, service providers, technology developers, alliances, and organizations related to all segments of this industry’s value chain. In-depth interviews of various primary respondents that include key industry participants, subject matter experts (SMEs), C-level executives of key market players, and industry consultants were conducted to obtain and verify critical qualitative and quantitative information as well as to assess future prospects of the market. The vendor offerings were also taken into consideration to determine the market segmentation. After arriving at the overall market size, the total market was split into several segments and subsegments, which were later verified through primary research by conducting extensive interviews with key personnel, such as CEOs, VPs, directors, and executives. Data triangulation and market breakdown procedures were employed to complete the overall market engineering process and arrive at the exact statistics for all segments and subsegments of the market. The breakdown of profiles of primaries is depicted in the figure below. The global automotive lead acid batteries market has a diversified ecosystem of upstream players, including raw material suppliers, along with downstream stakeholders, vendors, end-users, and government organizations. Companies operating in the global automotive lead acid batteries market include Johnson Controls Inc. (U.S.), GS Yuasa Corporation (Japan), Exide Technologies Inc. (U.S.), and EnerSys Inc. (U.S.), among others. In March 2016, GS Yuasa introduced the SLR-1000 Advanced Nano-Carbon Lead Acid battery. This new SLR-1000 is a 2-volt Advanced Lead battery which provides an unprecedented 5000 cycles at 70% DOD (Depth of Discharge). In October 2015, GS Yuasa International Ltd. Which is a subsidiary of GS Yuasa Corporation entered into an agreement with Panasonic Corporation on GS Yuasa’s acceptance of Panasonic’s transfer of its lead-acid battery business to GS Yuasa. The impact of this acquisition would result in promotion of streamlining of production by spreading the production know-hows through our global horizontal business network and enhancement of development speed in order to respond to the diversification of product development demands. In October 2014, Panasonic and UNO Minda (India) agreed to manufacture lead acid battery. This JV was aimed towards strengthening the global presence of Panasonic. What would be the future of automotive lead-acid battery? What are the damages caused to the environment by increased dumping of used batteries? 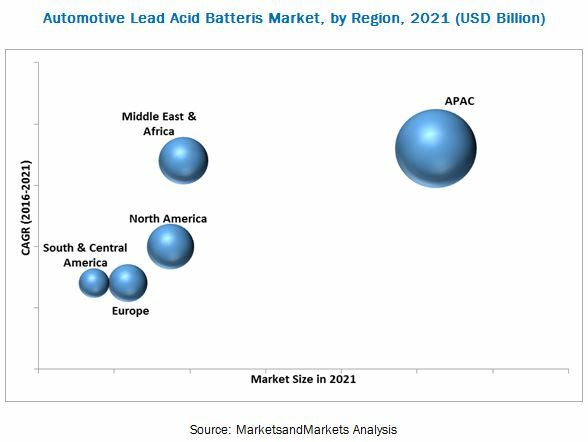 How increased adoption of EV affect the automotive lead-acid battery market? Rising demand for batteries from end-user industries and drying up resources lead to new players entering into the battery recycling market? How government policies can propel the growth of battery recycling market? The global automotive lead acid batteries market is projected to reach USD 45.03 billion by 2021, at a CAGR of 4.8% between 2016 and 2021. The growth of this market can be attributed to the growing demand from the automotive industry and the used vehicles in the developed economies, including China and the U.S. The passenger cars segment dominated the global automotive lead acid batteries market in 2015, followed by the LCVs & HCV’s. The passenger cars segment is projected to witness highest growth from 2016 to 2021, due to the increasing demand for the batteries in starting, lighting, and ignition. Flooded battery was the largest segment of the automotive lead acid batteries market in 2015. It is the most common type of battery, and is used in a wide range of automotive applications. Enhanced flooded batteries is projected to be the fastest-growing segment between 2016 and 2021. This growth can be attributed to long life, and cost and environmental benefits associated with lead acid batteries. Asia-Pacific is projected to be the fastest-growing market, as it is a major consumer of the automotive lead acid batteries. There is an increasing demand for automotive lead acid batteries from countries such as Japan, China, India, Australia, and others. The increasing sale of vehicles in China and India is expected to drive the growth of the automotive lead acid batteries. Growing population, rapid urbanization, and investments in end-use industries are projected to drive the growth of the automotive lead acid batteries market in Asia-Pacific. Even though new technologies such as lithium ion batteries have been introduced in the market, lead acid batteries is a key technology in the automotive market, owing to its low cost and excellent performance in cold and hot temperatures. Key players operational in the automotive lead acid batteries market include Johnson Controls Inc. (U.S.), G.S.Yuasa Corporation (Japan), Exide Technologies Inc. (U.S.), and EnerSys Inc. (U.S.). These companies adopted various strategies to increase their shares in the market. New product launches, acquisitions, and expansions are some of the key strategies adopted by market players to achieve growth in the automotive lead acid batteries market. 13.8 Northstar Battery Company LLC. 13.17 Koyo Battery Co., Ltd.
13.18 Tai Mao Battery Co., Ltd.
13.20 Thai Bellco Battery Co.,Ltd. 13.21 Thai Bellco Battery Co.,Ltd. Figure 30 Customer Segment, By Major Countries, 2016 (%) : U.S. Figure 43 Automotive Lead Acid Batteries Market, By Region, 2016-2021 (USD Million)"